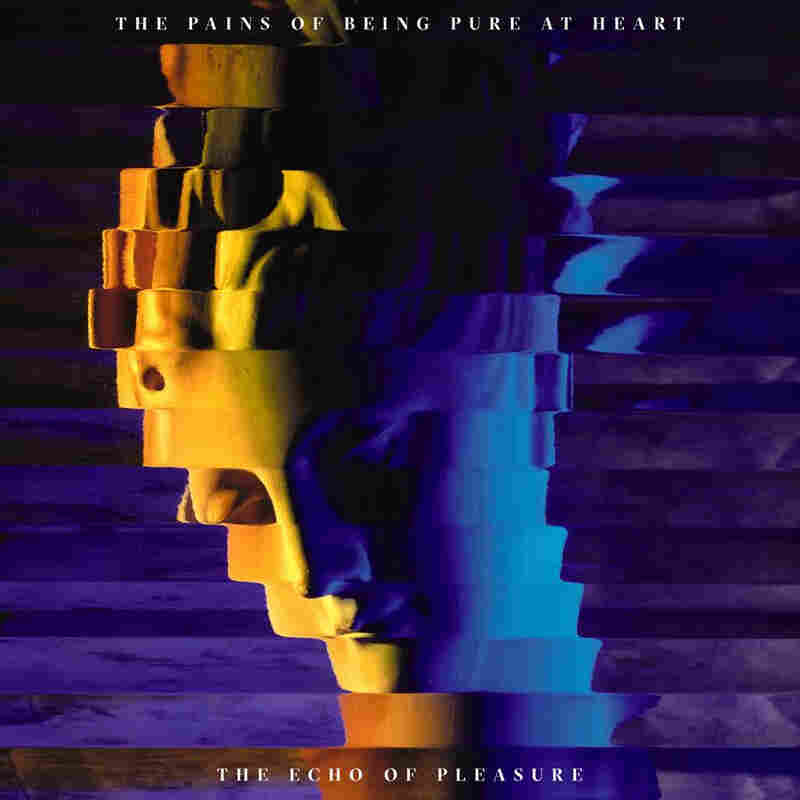 Stream 'The Echo Of Pleasure,' By The Pains Of Being Pure At Heart The band's latest album finds frontman Kip Berman entering a new chapter in his life with a growing family and the complicated feelings of growing older while staying in love. Watch any romantic movie, and you'll notice that relationships are typically portrayed in their dramatic beginnings or tumultuous, heartbreaking endings. It's rarer to see depicted what comes in between, when the initial heart-skipping sparks of attraction morph into something richer but more complicated. That middle section of the story is where we find Kip Berman on The Pains Of Being Pure At Heart's fourth album, The Echo Of Pleasure. As The Pains Of Being Pure At Heart's primary singer and songwriter, Berman has always rendered aspects of his life into his music. From the fizzy allure and bittersweetness of his 20s to the creeping responsibility of adulthood, he sings with a sense of wistful honesty and, when bolstered by the band's effervescent melodies, with joyful idealism. But as he was writing and recording new material, Berman was facing a major life change: He and his wife were expecting the birth of their first child. Berman has said he couldn't help but let that uncertainty — such as worrying about providing for his burgeoning family, and wondering what it meant for his band — influence his songs. The resulting album represents his most mature and personally revealing yet — without losing any of the The Pains of Being Pure at Heart's trademark infectious charm and sincerity. That's especially true of "When I Dance With You," an ecstatic dance-ready song built from buoyant beats and glistening synths that imply a fleeting, lose-yourself-in-the-moment headspace, but actually exposes deeper meaning: Contentment derived from inseparable togetherness washes away, at least temporarily, fears of an unknowable future. "When I dance with you, everything else just slides out of view... when I dance with you, I feel OK," Berman sings. And on the dynamic opener, "My Only," Berman gives into his love and unwavering commitment, earnestly declaring "Now that you're here, I don't have a fear, you're my only / So keep it together, I won't find another love like I found you." Throughout its nine songs, The Echo Of Pleasure balances the complex shadings between lust and sensuality, blissful devotion and messy accumulation of regret. On "Anymore," he exposes his own flaws, and ruminates on whether he can live up to others' expectations: "Don't need to be told what I'll never be, anymore," he asserts. Later, the glimmering "Falling Apart So Slow" charts a seasonal year wherein intimacy unravels in his absence; and "The Echo Of Pleasure" describes how dynamics can change and decay when feelings are left unreciprocated. "The echo of pleasure can't return / Just fade into these silent days... I was young and sick with love / Now I'm sick with something else," Berman concedes. Mirroring Berman's resonant themes, there's maturation in the music, too. Across its previous records, The Pains Of Being Pure At Heart toggled from the lo-fi shoegaze of its self-titled debut to the stormy distorted heft of Belong to the nimble indie pop the band is now best known for. With The Echo Of Pleasure, Pains reshapes its sonic palette once more. With bright, chest-swelling pop anthems such as "The Cure For Death" and "The Garrett," the band absolutely sparkles, blending shimmering hooks, noisy guitar lines and snappy beats with swirling female vocal harmonies that crest into celebratory sing-alongs. Many of Pains' ever-widening net of friends pop up to flesh out Berman's widescreen tapestry — including singer Jen Goma, who takes the spotlight on the retro dance track "So True." "If you don't lose some skin for the things you believe / How do you know that you really do," she asks over fluttering keyboards and disco drum beats. What makes The Echo Of Pleasure so powerful is the way The Pains Of Being Pure At Heart can address somber themes with such warm positivity. As he's grown older and gained perspective as a songwriter, Kip Berman has settled on a beneficial, aspirational lesson: Healthy, enduring relationships require frequent compromise and reassessment over time, but if nurtured, the rewards can be limitless.